Photographers and video operators frequently wish to fix a heavy camera (with a weight about three kg) on a model. For persons who set such serious standard for the image, I'd like to recommend a full-size plane with a live operator on its board. For shooting from a radio-controlled model, a manual camera with the weight up to 1 kg should be fit. If you, for example, remove a telescope from the tripod and hang it with a string, you'll not be able to watch the Moon independently on the price of the telescope (this is to explain figuratively why an expensive camera is not necessary). The other widely spread objective is usage of sophisticated systems of stabilization hoping their irreproachable operation just after the installation. More reasonable way would be striving to the maximum simplicity of the construction combined with high reliability of it. A photographic camera does not require an active stabilization; it is sufficient to make series of tens of shots and then to choose the best of them. A helicopter needs a scrupulous adjustment of the model, elimination of vibrations in mechanisms and balancing of rotating units. A model of a plane needs good aerodynamics, good weather and correctly chosen speed of flying. However, the most important factor is an ability of smooth controlling of the model. 1. It is necessary to record the video-signal on the board because in any case interferences occur even, if the best samples of radio-transmitters are used. 2. The video-signal should be recorded non-mechanically, i.e. on the Flash-memory card. 3. The wide-angle optics is necessary for better orientation at the locality according to the transmitted image. 4. Vibration of the camera is less noticeable, if the wide-angle objective-glass or "fish eye" objective is used. 6. It is advisable to set the manual focusing and short exposure. The larger the model of the helicopter is, the more stable its flight is. The acrobatic models of helicopters can lift the amount of weight, which is equal to their own weight; however, the weight of the model must not be increased more than half as much again. If the weight of the model has increased half as much again, it is advisable to increase the length of the blades by 15%. The rotor with four blades is more preferable than the rotor with two blades. The profile of the blades must be asymmetric. The symmetric blades are necessary only for the 3-D flights; their efficiency coefficient is lower than the efficiency coefficient of the common profile. The speed of the rotor rotation must be lower than 3-D mode. Seeking for reduction of the RPM, the gear with the number of teeth, reduced by 15-20%, is to be fixed on the engine, as regards the acrobatic variant. 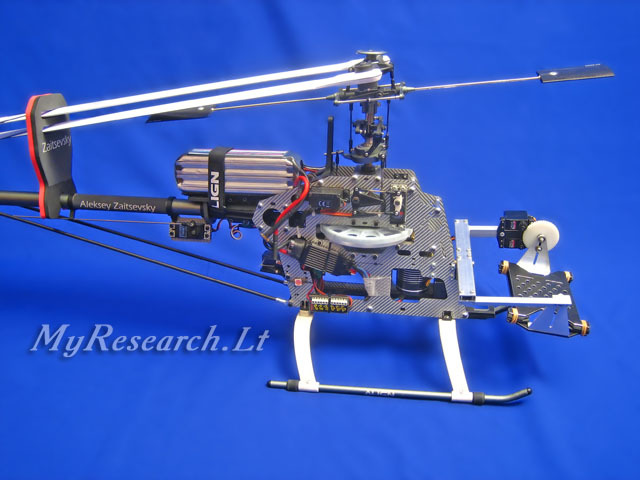 Seeking for reduction of vibrations, noise and dirt, it is desirable to select the electric helicopter. The helicopter with the increased load, which does not perform abrupt maneuvers, can and must consume less energy than the acrobatic variant. While selecting the motor and batteries, attention must be paid more towards economy, capacity and weight than towards the maximal power, discharged during a short moment. A particular attention should be paid to helicopters with several rotors (so called multicopters). As a rule, such aircrafts yield to an ordinary helicopter in some parameters, such as lifting capacity, mobility, and duration of fly. The listed imperfections are bound to a large extent with using fixed-pitch props; however, a probable alteration of the situation is expected in the nearest future. The advantages of these aircrafts include their good systems of electronic stabilization and autopilot for low prices; in addition, they can be more easily operated by a non-experienced pilot as compared to ordinary aircrafts, their exploitation and repairs are simple, they are more safe in a case of a crash and a camera may be placed in the center of the frame such an aircraft. Many persons are very greedy in respect of technical parameters of a model: they wish it to cover the maximum possible distance on fly, to achieve the maximum possible duration of fly, to carry a large cargo, to have a nice body, to have the autopilot fit in any case and so on. Usually, a list of such requirements is in inverse ratio with the concept of "reliability", so the model will distinguish itself for poor controllability and stability. The mechanical gyroscope is used for compensation of swinging. The camera is installed on the freely swinging platform. 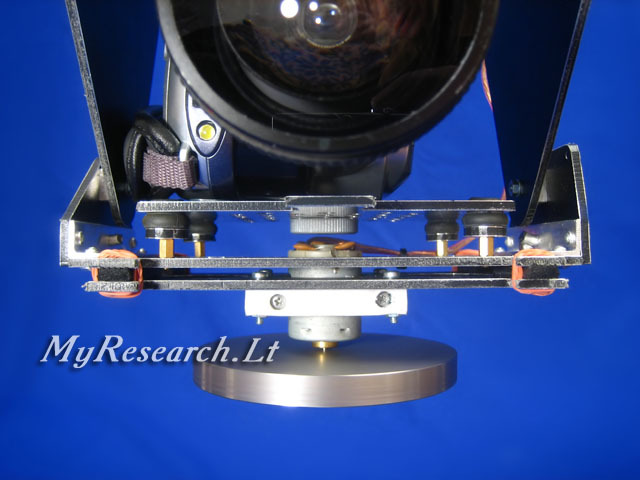 The heavy mechanical gyroscope is installed together with the camera on the platform. If positioning of the platform is evened with the help of the shock-absorbers, the gyroscope makes swinging more fluent. The effect of precession is the drawback of the mechanical gyroscope. The example of the effect of precession: the inertia pulls the camera to the left, whereas the camera deviates upwards. The gyroscope stabilize the camera efficiently, but it causes strong high-frequency vibrations through insufficient accuracy of production. If there is no possibility to produce the precisely balanced flywheel of the gyroscope, it is necessary to increase its mass and to reduce the revolutions of rotation. 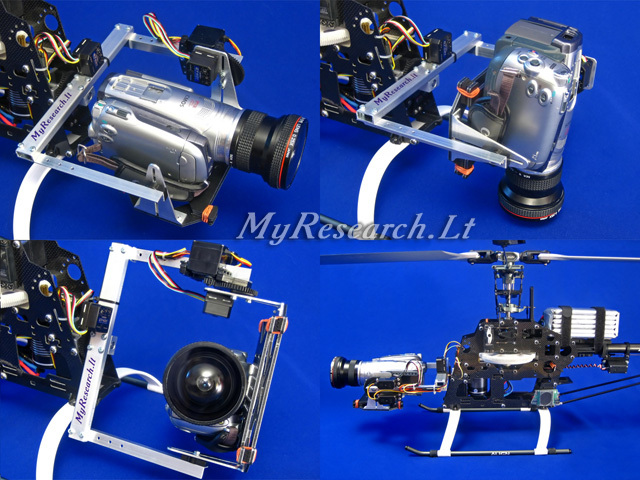 The mechanical gyroscope is an ideal solution for stabilization of the camera, if it is not needed to maneuver during shooting. The camera must be balanced in such a way so that the axle of the switched off gyroscope is strictly vertically positioned. If the camera is installed on the inactive object, for example - on the Dirigible balloon, the centre of the platform's mass with the gyroscope and the camera can be lowered for several centimeters downwards as regards the axles of the suspension bracket. The center of the mass must be brought nearer to the axles of the suspension bracket, installed on the movable object, for example, on the helicopter, otherwise the camera will be swinging during the maneuvers as a large and heavy pendulum (fluently, but for a long time). Efficiency of operation of the gyroscope depends upon the mass of the camera and upon precision of balancing. The platform with the gyroscope must be turned around in the horizontal position. If the gyroscope is tilted at the moment of turning around, the camera will also tilt through the effect of precession. 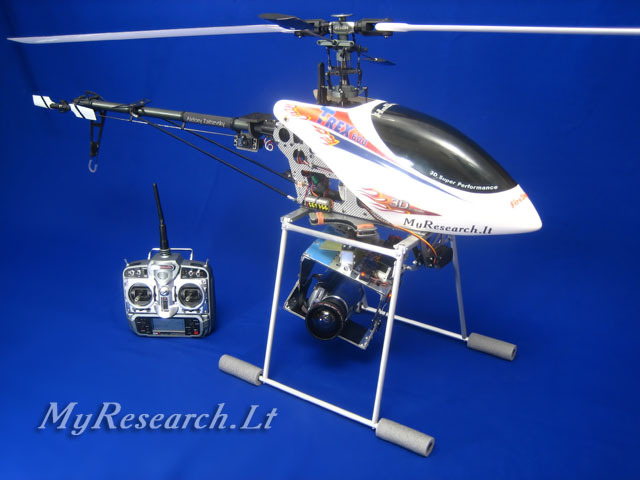 The radio-controlled helicopter is an apparatus, which is too light; it cannot secure ideal stability of the camera. Thus, still persisting vibration is eliminated with the help of the computer filter prior to showing the shot video-stills. The photo-shots with a long exposure rarely work well. An active mount allows guiding of the camera in the necessary direction, in spite of the position of the model. Usually such platform is provided with two axles - the panorama and the tilt. The direct drive from the standard servo-mechanisms is used for the light cameras. 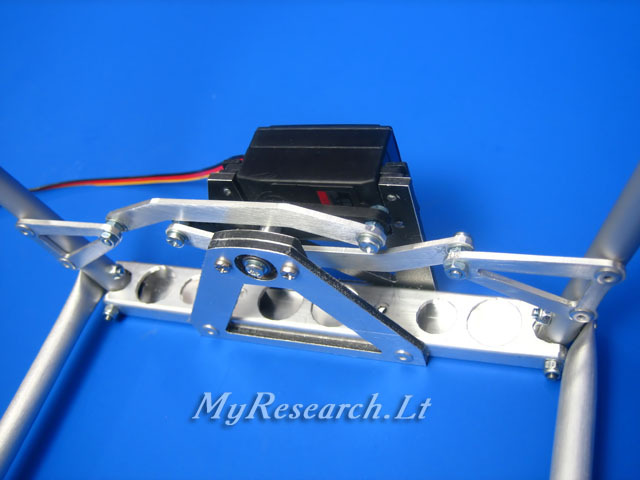 It is an often case, when the servo-mechanisms with the increased tilt angle are used. Also the active gimbal may be used for stabilization of the camera. The gimbals, provided with three axles, are used for stabilization - the pan. (Z), the roll (Y) and the tilt (X). 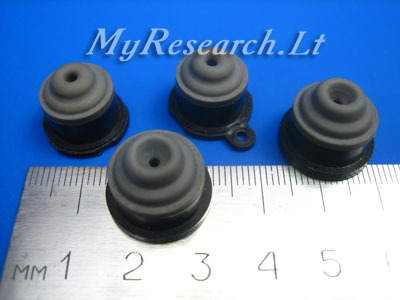 Pay Your attention to the fact that some gimbals, provided with three rotation axles, secure the possibility of stabilization in certain positions only along two axles. It happens so, if the axles of the gimbal get combined. 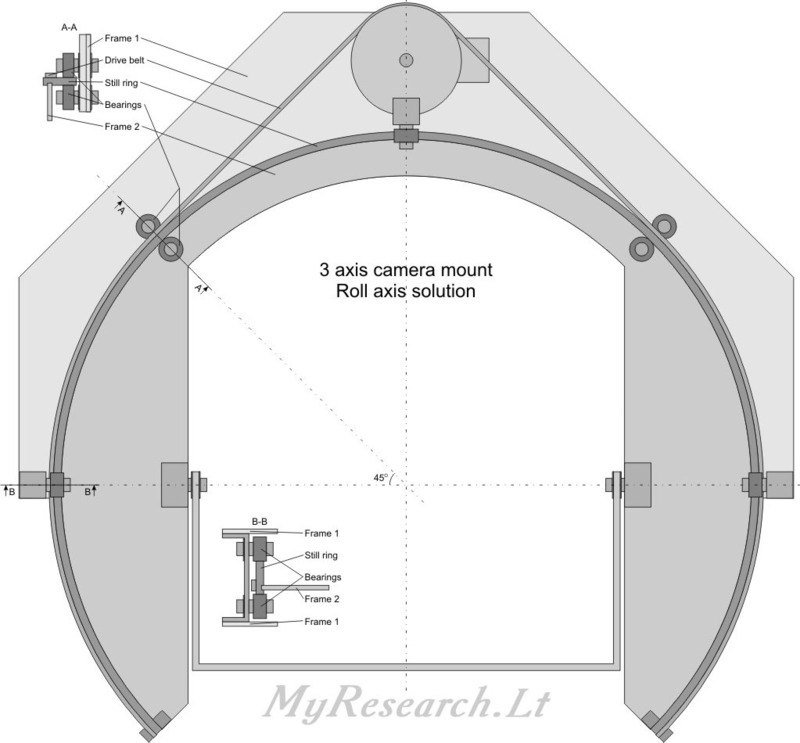 For example, pay Your attention to the gimbal, where the camera is installed inside the rotating transverse ring. If the camera is turned downwards, the axles of the panorama (Z) and of the roll (Y) will coincide, whereas the lateral swinging of the model will pass to the camera. 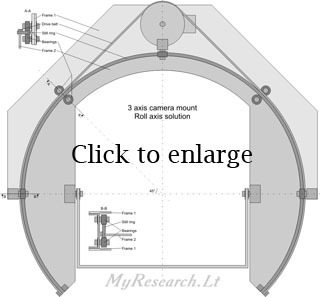 Presence of the rotating ring around the camera is the most complex and unreliable point of such constructions. 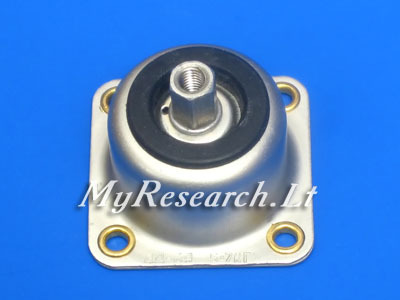 The purpose of this ring is to secure that the center of the mass of the platform remains in the same place in the course of rotation along all axles. The ring rotates according to the principle of the large bearing, but it is produced out of the light metal. Deformation of such construction caused gaps and jamming. I submit an example of the alternative solution in the scheme below. The radial fastening is done only in two points. Thus, flexible deformation of the steel rim does not cause gaps or jamming. The axle of the tilt remains the third one in succession; it means that the three-dimensional stabilization of the camera is always possible. A three-axle suspension can ensure an immobility of a camera on an instable model; however, on an intentional turning of the camera, the horizon may tilt. If, for example, the front part of the model is uplifted, the vertical axle of the suspension will be tilted; if the camera is turned sidelong and the horizon is even, any turning of the camera forward will cause rolling of the horizon. To avoid the said effect, a four-axial suspension should be used. In a four-axial suspension, two axles ensure the vertical position of the third axis of panoramic rotation and the fourth axle ensures tilting of the camera. As in the above-described version, the centers of masses of all movable units should exactly coincide with axes of rotation. Hereinafter, an example of a four-axle suspension is provided. The axles of horizontal stabilization are not controllable. The axle of panoramic turning is controllable and it is stabilized by the electronic gyroscope. The axle of tilting of the camera is controllable; however, it is not stabilized. 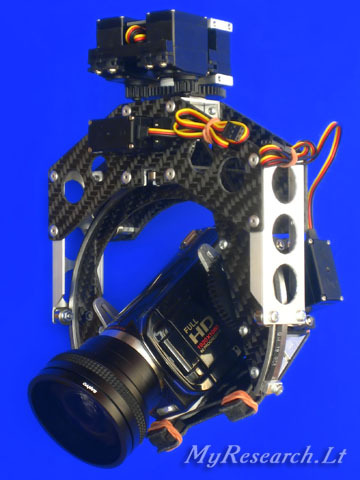 To avoid vibrations of the camera, damper for impeding the rotation is fixed on the controllable axle of tilting. The controlled tilting of the camera causes a deflection of the vertical axis, so the control should be smooth. To avoid a deflection of the camera during horizontal movement, the center of air pressure should coincide with the center of the mass of the rotating unit and with the axis of rotation. Thanks to the movable clampers, the frame of the suspension can be fixed on the frame of radio controlled helicopter made by any manufacturer. 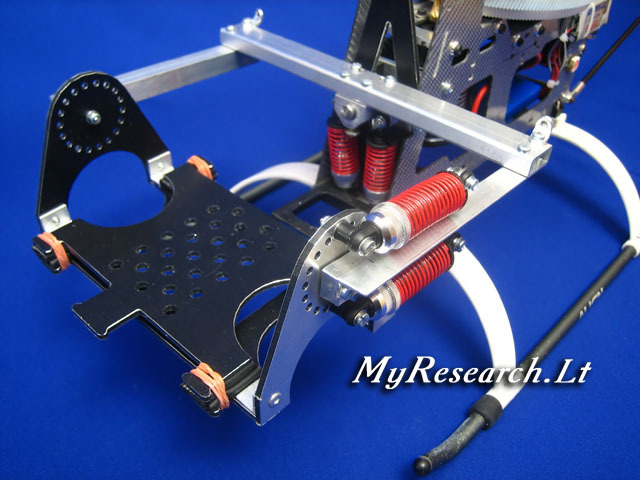 It is also convenient to place a suspension of the said type in the central part of multicopter. The vertical position of suspending is ensured by rubber stretchers with a very low tension to avoid swinging. Such a suspension of the camera ideally preserves its position upon acceleration of the model in any direction. When the model swings, the swinging is partially transferred to the camera. If the rubber stretchers are eliminated, swinging is not transferred to the camera; however, the camera inclines gradually. If the axle of rotation does not coincide with the center of the mass of the rotating object, operation of the servo causes swinging of the construction. The example of the gimbal, in which the roll axle is above the camera, is submitted below. The servo of such axle must be switched off from the potentiometer (modification for 360 degrees). Such gimbal may be used for controlling of the camera. But the servo cannot be efficiently used for stabilization. The mechanical gyroscope may be used for stabilization. 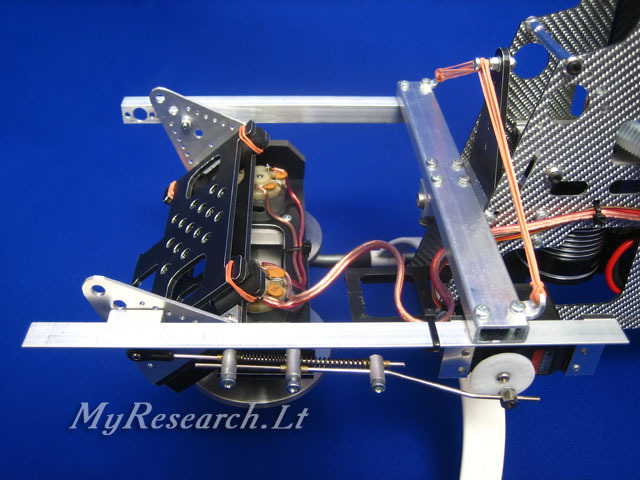 The mechanical gyroscope is more efficient than the electronic one because electronics itself does not secure stabilization, but operates via the servo. 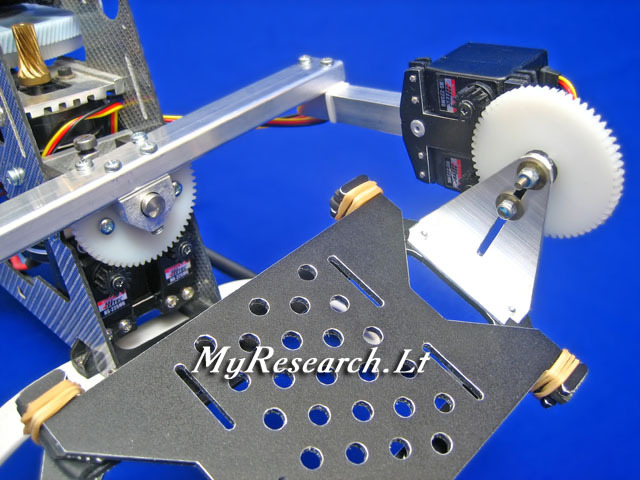 The delayed reaction and clearances are the drawbacks of the servo drive. The view becomes inaccurate though slight twitching of the camera. According to this example, presence of the spring between the servo and the camera allows to use the standard servo without the reducer. The standard servo's torque is sufficient enough, if the center of the camera's mass is correctly fixed. The extra reducer, which increases the power of the torque, lowers the speed of rotation of the platform. Usually the servo with the excessive torque and the extra reducer is installed, seeking for elimination of swinging, which may get intensified due to the executive mechanism. 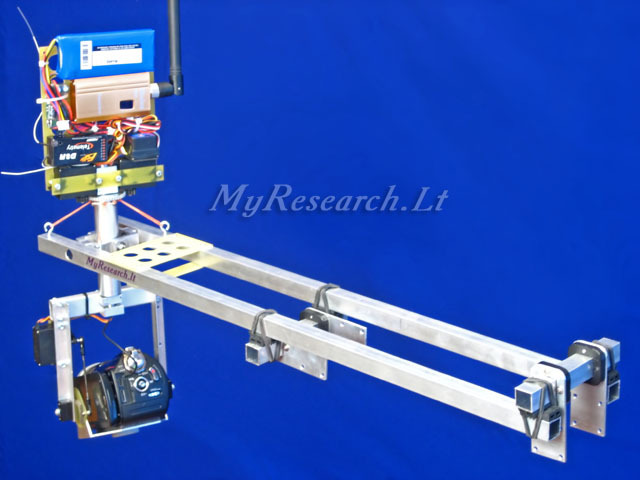 As inertia is typical of the mechanism with the video-camera, it does not stop during quick rotation in the point, where the servo without the load would stop. After the mechanism rushes by the neutral position, the servo starts to return it back. Swinging occurs as the result of it. The mechanism with the powerful reducer is unable to rotate the camera quickly; it itself serves as a good brake. 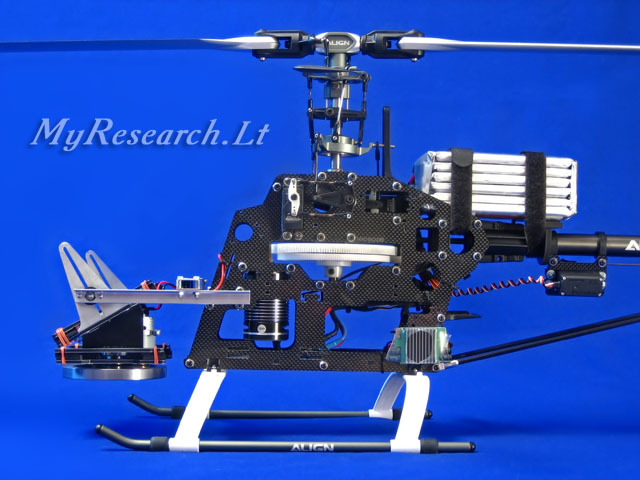 The experienced modelers are aware of the fact that the electronic gyroscope will not be able to maintain the helicopter evenly, if a slow servo is installed on the tail, i.e. 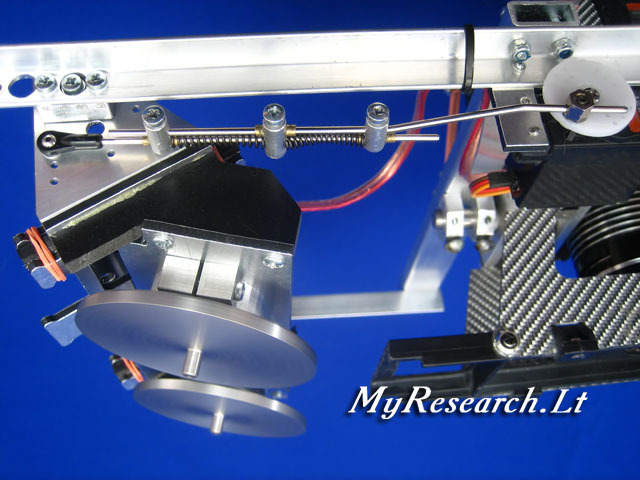 a slow drive of the servo is inefficient for stabilization at abrupt movements. 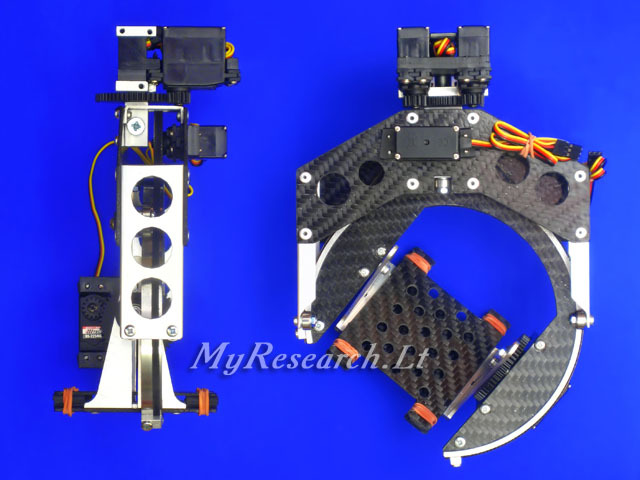 Another solution is implemented in the next gimbal - two servo-mechanisms, assigned for each rotation axle, are used. The system, provided with double servo-drive, is simple enough. Probably, You have seen trembling of the ailerons of the models, attributed to the class F3P, prior to taking-off. There is no "trembling" in the course of the flight due to the load, created by the air-flow. Two installed servo-mechanisms operate synchronously, but, staying in the neutral position, they create the slight load, controlled in the opposite directions. Clearances in the transmission get eliminated, the dead zones of the executive mechanisms get compensated and swinging gets eliminated as the result of it. 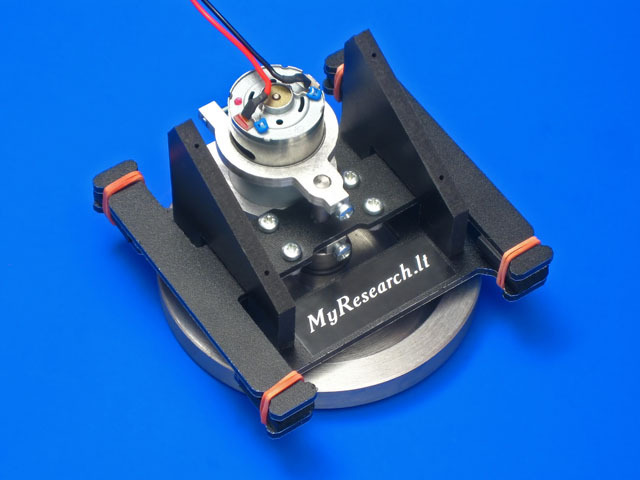 Accuracy of the video-view gets increased at the expense of soft operation of the double servo-drive. By analogy, position of the animals' limbs is fixed with a pair of the opposite muscles. This information may be useful for making a servo-drive. Some producers state that the clearance gets eliminated, if the gears are substituted with the belt. The well-installed gears do not have any clearances and secure more rigid a transmission, if compared with the belt. The belt is handy, if the distance between the drive-gear and the driver gear is large. Take the best samples of the servo and You will find five pairs of the ordinary gears, but not the belts inside. The belt produces less noise in the course of operation than the gear does, but the level of the sound noise on the radio-controlled helicopter, caused by the servo, is of no importance. The camera mount of the helicopter without the axle of the panorama was introduced above. The axle of the panorama was not installed, seeking for securing the acceptable quality of shooting, with taking into consideration the small weight of the construction. The interrelation of the dimensions of the construction, its rigidness and weight was talked over above. In case of such variant of fastening, the suspension bracket allows achievement of active stabilization of positioning of the camera in the horizontal flatness along the axles of the longitudinal tilt and lateral lurch. Two electronic gyroscopes are used for controlling of these deviations. 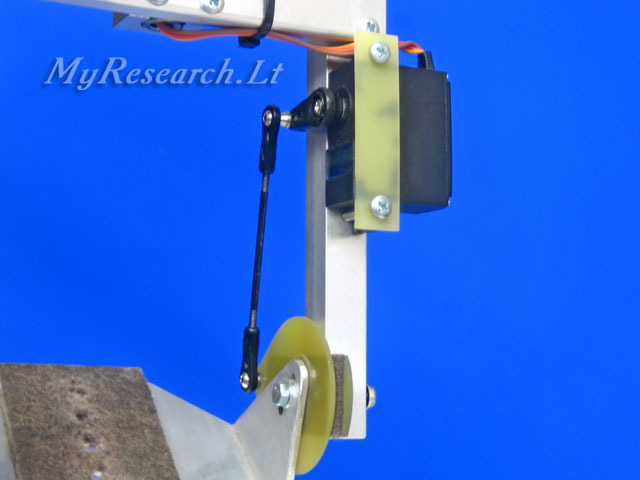 Stabilization along the axle of the vertical rotation is achieved with the help of the gyroscope, installed on the board. One person can control the model and the camera. Seeking for this, availability of the extra systems, assigned for stabilization of the model along the optical horizon, height and coordinates, is desirable. The scheme of connection of IR sensor to an ordinary servomechanism is provided in the paper "Modification of servomechanisms". If shooting must be done not from the fixed position, but in motion, two control panels are used for controlling the camera and the model. The turn of the helicopter may be controlled from the both control panels. Seeking for this, the signals from two receivers are mixed with the help of the mixer V-Tail. While shooting, the operator orients the model towards the object under shooting, whereas the pilot controls the model, keeping to the set course. 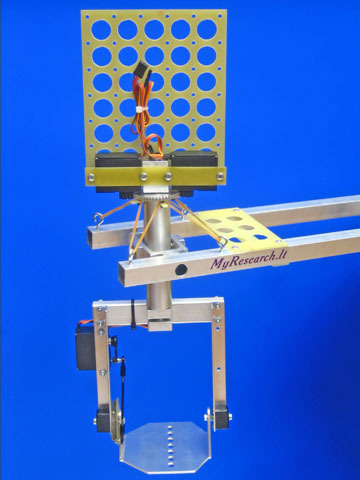 Also distribution of the control signals between two control panels is possible on the ground. Read more detailed information about the methods of mixing in the article "Mixing of the control signals from different control panels". The often occurred necessity for the pilot to lead the helicopter sideways serves as the drawback of such control method. The possibility to follow the moving object more precisely serves as the advantage of such method. It is convenient to control positioning of the model at a glance from outside and to follow the set course according to the view of the camera, installed on the board. .
Today a majority of manufacturers of active suspensions strive to satisfy the frequent foolish request of clients - to make a light suspension for a large camera with three control axles and active stabilization. If you have already acquired such a product, you can make the following experiment: take a wide-angle camera of a high resolution without an optical stabilizer (not switched out but absent at all); fix the camera tightly in the central part of the body of the model; and then try taking video. If your model is well-adjusted and its vibrations are not too high, in a majority of cases the obtained image will be more sharply defined as compared to a case when a special suspension is used. An active suspension can ensure an immobility of the horizon line; however, because of a weak structure, it may intensify vibrations and cause remarkable jerking thus impacting the sharpness of the image. Using of dampers may cause resonance vibrations of the construction. In other words, if you lack experience in designing and adjustment of mechanical systems, it would be reasonable to strive to the maximum possible simplification of the structure. In the ideal version, the gyroscope should be mounted on a unit that is rotated by the servodrive connected with the gyroscope. In such a case, the heading hold mode, or AVCS, is used; however, if the structure of the suspension is not sufficiently stiff and any free play exists, the camera will vibrate in this mode. In the other version, the gyroscope is fixed on the frame and the servogear rotates the structure in respect of the frame. In such a case, the mode of the usual compensation is used; however, a gradual shift of the position of camera will take place. In the second case, a more exact adjustment of the gyroscope is required. The camera must be installed in such a way so that the center of gravity of the rotating platform coincides with the rotation axles. 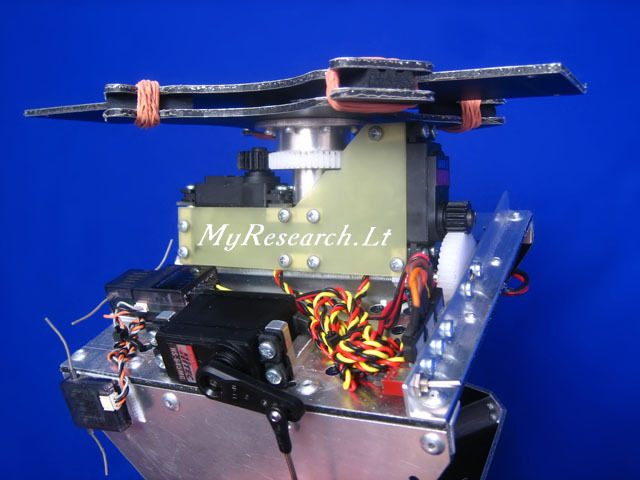 Seeking for this, it is necessary to remove the gears from the servo and to achieve the balance of the platform. The balance is checked in the horizontal and vertical position of the camera. The purpose of the servomechanisms is preservation of the horizontal position. A better balance of the suspension reduces the load on the servomechanisms, so active stabilization does not require powerful servomechanisms. The camera must be rigidly fixed on the body of the model, if acrobatic flights are performed. This video proves how strong acceleration can be at the moment of gyration of the helicopter. An ordinary camera was installed under the tail rotor; the carbon stanchion of the camera got broken at the moment of the tight turn. Of course, performance of such abrupt maneuvers with the camera is undesirable; however, the reliable fastening must be secured. A flying_wing model is used. The wing-span is 120 cm; the weight to be flied is 700-1000 g. The model is heavy enough, mobile and stable so as to avoid severe dangling in the air flows, but it is sufficiently compact for conveyance. 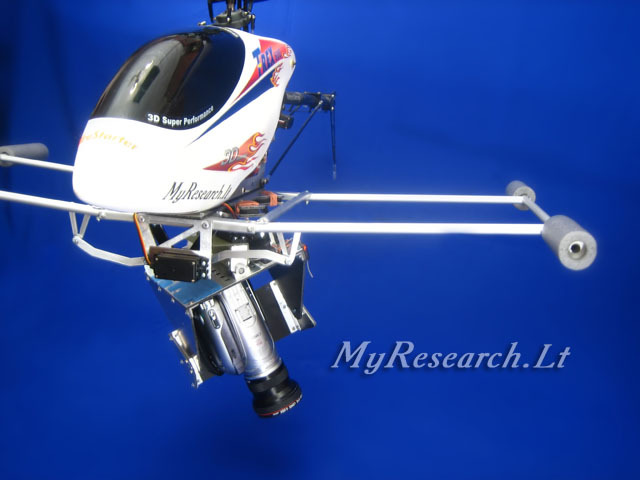 Braking with the help of the motor allows executing steep lowering and total dropping of the speed in several meters. The photo-camera "Canon IXUS 5.0" is an amateurish camera; its dimensions are small and it is contained in the metal case. A recess is cut out in the center of the foam-rubber wing for installation of the photo-cameras; thus, the photo-camera does not almost stick out. The photo-camera is used in the constant photo or video shooting regime. The 2 Gb memory card is fully filled during in 5 minutes of flight. The necessary arrangements are as follows: a short exposure, the fixed focus, the shutter button remains clamped from the moment of launching of the model. Several mostly successful photos may be selected out of 1000 taken photos after landing. This photo-camera has an analogous video output; the signal, coming out of it, is transmitted to the earth in the course of flying, seeking for a more successful positioning of the model. 0,5 W, 1 GHz transmitter was used for transmitting of the video signal. The portable TV-set was used for reflection of the signal.Once the model crashed to the ground at a high speed, but the photo-camera remained undamaged.